I've driven lots of cars with more than 500 bhp, and they were all fun to drive. The most powerful car I've ever driven was a Mercedes S65 AMG which had 630bhp. Lots of power equals lots of speed equals lots of fun. I've had my kicks and malarkey galore in a Mercedes SL63 AMG, Jaguar XKR-S, Lotus Exige S, Porsche 911, Maserati GranTurismo Sport, Bentley Continental GT Speed, Chevrolet Camaro and lots of other licence losers. But bhp doesn't necessarily equal fun. Power means weight and weight means less fun. But, you may say, more weight PLUS more power equals fun - surely? Not on the road it doesn't. On a race track any of the cars above are brilliant. All but the Bentley are real wheel drive so you can practice drifting or getting a corner just right with plenty of run-off that you can slide across before hitting anything solid. On a road, where you only get 12 inches either side of your car before hitting a kerb, hedge, lamppost, deer, house or other car oversteer is not so desirable. Fast cars have big engines and you can watch videos of them on the internet sliding around here there and everywhere. You cannot do that on the road. Yes, a very fast car is super-fun. The 550bhp Jaguar XFR-S saloon is immensely powerful and great for the short amounts of time you get to use that power. You'll get your foot flat to the floor for maybe 2 seconds before you have to back off. What is more satisfying on the road is a decent balance, tyres that aren't super grippy, rear wheel drive and enough power to break traction. You also need a manual gearbox and a naturally aspirated engine. Automatic gearboxes might be fine for cruising but when at the limit YOU need to change gear, not the car. Similarly when perfecting a line through a corner the last thing you need is turbo lag. You see, it is harder to control a bigger, heavier car at the limit, and within the physical limits of normal roads, because of its inertia. More inertia (due to extra weight) means you need more power to get closer to the edge, and it will break away from the limit faster and more instantly than a less powerful, smaller, lighter car. Big, fast, powerful cars are awesome, but only in a straight line. Hit your favourite twisty roads and you'll be backing off. You'll sort of have fun as you press the throttle coming out of corners, and apply the brakes before the next. You certainly won't test the limits of its adhesion with a massive oak tree sitting at the apex of the corner. 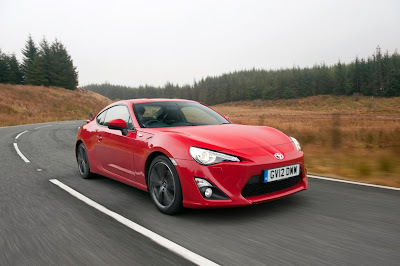 But in a Toyota GT86, Subaru BRZ, Lotus Elise, Mazda MX5 or Porsche 944 S2 you will. Each of these cars possesses balance in spades, and none of them has more than 200bhp. The only powerful sports car I've driven that comes to close to the cars above in terms of feel and ability to drive fast on the road (rather than track) is the Jaguar F-Type V6 S, which has 340bhp. And it has a supercharger, so no lag. Jaguar's engineers have worked wonders on the chassis so that it feels fast on the road but you can also feel the grip steadily getting away from you. But it costs £67k, which is out of the reach of most of us. Modern Porsches are built for the track and are compromised on the road. The Cayman's 2nd gear that does 76mph is a telling sign that it was developed on the Nurburgring rather than the Snake Pass. If you want real sports car fun on the road get one with the engine in the front, rear wheel drive, a manual gearbox and no more than 200bhp or 1200kg. I promise - you'll have more day to day thrills in any of the cars I've suggested than in a Porsche 911 GT3.